Making your own stockings is easy and fun, especially if you use a pattern. You can welcome a new member of your family with his or her own Christmas stocking or simply create some festive holiday decorations. Whether you're handy with a needle and thread or prefer not to sew, there's a stocking pattern for you. Try one of these fun designs for the holiday season. This pattern has a lot of pieces, but it's actually really easy to construct. You can make it by hand for the most professional results, or if you're in a hurry, you can sew it on your machine. Either way, it makes an adorable and festive decoration for a special person. Expect to spend about three or four hours sewing this by hand. Click on the image of the pattern to save it to your computer, then print it according to the specified size. If you need help downloading and using this printable pattern, use these tips to help. 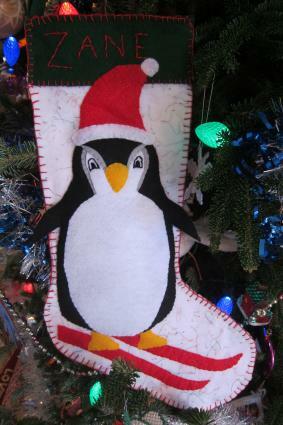 Print this penguin stocking pattern. Cut out the pieces for your stocking according to the colors specified on the pattern. To help you keep the pieces straight, it's a good idea to pin the pattern piece to the corresponding piece or pieces of felt. Center the gray penguin head piece behind the head portion of the white penguin belly piece and secure with pins. Using white thread, sew the pieces together. Layer the penguin head/penguin belly piece on top of one black penguin body piece. Secure with pins. Use white thread to sew the belly to the body and gray thread to sew the head to the body. Center the gray penguin face piece behind the black penguin face piece and secure with pins. Using black thread, sew the pieces together. Layer the penguin face over the penguin head and secure with pins. Using gray thread, sew the face to the head. Center the yellow penguin beak over the face and secure with pins. Using yellow thread, sew the beak to the face. Lay one white sparkle felt stocking piece on your work surface. Arrange two red skis on the foot portion of the stocking. The bottom ski should be about an inch above the bottom of the foot, and the top ski should be about half an inch to an inch above the bottom one. Place the penguin on top of the skis and adjust the ski placement to get the look you want. Pin the skis in place and then use red thread to sew them to the stocking. Place the two penguin feet on the skis and check the placement by holding the penguin in place. Adjust as needed and then pin the feet to the stocking. Use yellow thread to sew them in place. Stack the penguin over the remaining black penguin body piece and position these on the stocking. The wings should stick out past the edges of the stocking. 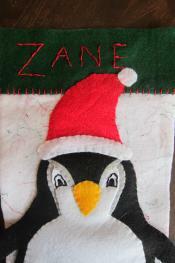 Use pins to secure the pieces and then sew the penguin on with black thread. When you reach the wings, sew the wing layers together. However, don't sew the wings to the stocking. Take one green felt cuff piece and pin it to the top of the white stocking with the penguin on it. 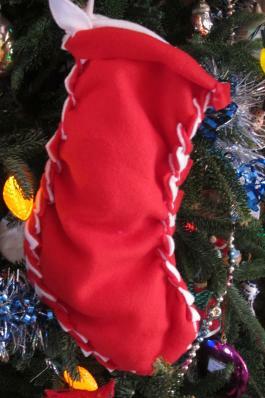 Use an embroidery needle and red embroidery floss to attach the cuff to the stocking. Place the red hat piece on the penguin's head and pin in place. Use red thread to sew the hat on the stocking. The point of the hat will overlap the green cuff of the stocking. Place the white hat fur and pom pom on the hat and pin in place. Use white thread to sew them on. If you'll be personalizing the stocking, take a few moments to embroider the name of the person on the cuff. Also embroider eyes for the penguin using black floss. Pick up one blank stocking piece and attach a cuff piece to it in the same way. Then stack this piece with the penguin piece, wrong sides together, and use a blanket stitch and embroidery floss to join the two pieces together at the top of the cuff. This will be the front of your stocking. Set it aside for now. Take the remaining white stocking piece and pin green cuff pieces to the front and back of it. Attach the cuff pieces to the stocking using red embroidery floss. Stack the two hanging loop pieces and use green thread to sew them together. Fold the loop in half and insert the ends between the layers of the cuff. Use a pin to hold it in place. Use a blanket stitch to sew along the top of the cuff and to secure the hanging loop. The back of the stocking is finished. Stack the front and back together and use pins all around the edge. Starting at the top of the cuff, use a blanket stitch and red embroidery floss to sew all the way down and around the bottom of the stocking. Finish when you reach the top of the cuff on the other side. This easy no-sew stocking uses red and white fleece to create a cute candy cane-inspired edge. This project goes quickly; expect to spend about half an hour on it. You may want to create several of these to use as gift bags for Christmas presents or to give to friends and family. Click on the pattern to download it to your computer. Then print and enlarge it as specified. 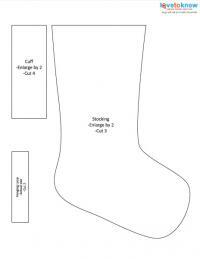 Print this no-sew stocking pattern. Use the pattern to cut one white stocking piece and one red stocking piece. Stack them together. Using the pattern as a guide, cut a fringe of 3/4-inch-wide strips all the way around the edge of the stocking. Use the craft knife to make a small, vertical slit, about half an inch long, in the center of each strip of fringe. Starting at the top, take the second two strips from the top and push them through the slit in the top strip. Turn them over so the color of fleece showing is the opposite of the previous strip. Repeat with the third strip from the top. Continue working your way down the stocking, alternating red and white as you go. When you reach the last strip, cut it in half vertically. Tie the two halves together in a knot to finish the stocking. Insert a hanging loop through the seam of the stocking and tie it in a knot. You're done! If you're still looking for some fun designs, there are lots of free options out there. Whether you love to sew or prefer to knit or crochet, there's a great design waiting for you. There are some amazing patterns for knitters who what to make their own stockings. These knit Christmas stockings are fun because they have old-fashioned handmade appeal. Patterns for Knifty Knitter stockings use the plastic looms to create lovely designs. This Fisherman stocking from Knitting on the Net is simple and lovely, knit in a single color. The design for this vintage stocking, from Knitting-And, is from 1945, and features an area to personalize the design with a name. The Christmas Stocking from Crochet N More is a simple, fast design that's perfect for beginners. The Button Christmas Stocking from Donna's Crochet Designs is a whimsical choice that features crocheted buttons all over a simple stocking. The Quick & Easy Stocking from Red Heart Yarn is a classic option that has a contrasting toe and heel. The Lacy Crochet Stocking from FaveCrafts is a great choice if you love the delicate look of open-work crochet. 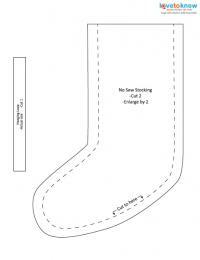 The Easy Stocking from McCall's is a design for a basic fabric stocking. It features a contrasting toe and heel and is fully lined. The Upcycled Sweater Stocking from DIY Network is a great choice if you want the rustic look of knitting without the hassle. Better Homes and Gardens offers four free patterns for sewing stockings, including a simple cuffed design, one with a decorative feather stitch, and one featuring fabric yo-yos. The Monogrammed Stocking Tutorial from SewLikeMyMom is a great option if you want to create a personalized stocking. Making your own Christmas stockings is a great way to add a personal touch to your holiday celebrations. The time and love you put into these projects will show in the results, which may even end up becoming family heirlooms. Have fun trying different designs or modifying patterns to craft your own unique holiday decorations.